There are a lot of clever jokes to make with the Dodge Challenger SRT Hellcat—cat jokes, hell jokes, jokes about how things might break off into your hand at any time. But this Hellcat looks like it traveled to hell and back, and is now ready to claim some poor soul who thinks it’s a feasible project car. Aside from wondering whether drivers, passengers or other people involved the incidents that maim cars at insurance auctions so severely are OK, it’s always interesting to wonder what triggered the chain of events that landed cars there, to be sold for a fraction of their value to people willing to take a chance on them. 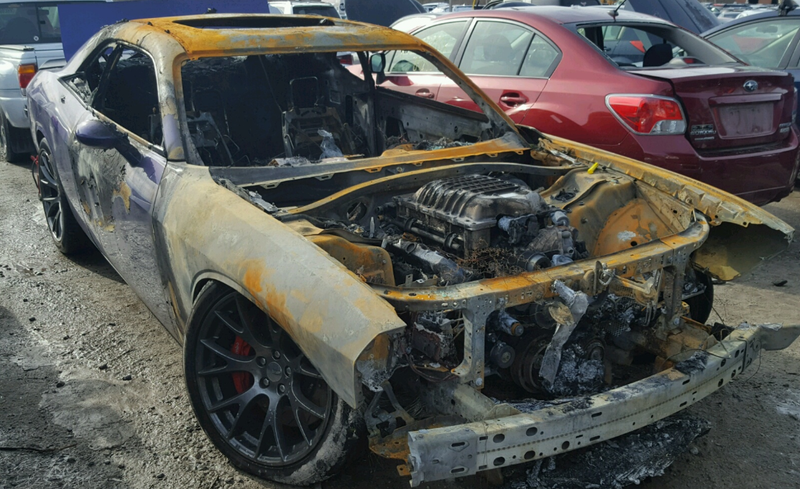 There are five 707-horsepower Challenger Hellcats up for insurance sale at auction site Copart right now, with one of them having been stripped way, way down. This roasted 2016 model is scheduled to sell on Friday with what’s left of a 6.2-liter V8 and an automatic transmission, along with half of a purple paint job and an interior that’s neither leather nor Alcantara. You’ll also have to replace the “D” in the Dodge logo on the rear end if you buy it, as the car probably had to offer some kind of sacrifice to climb out of hell. The current bid is $70, but it would only be right for this car to sell with “666” somewhere in the final number. Go forth and surrender yourself to this soul-sucking project of a vehicle. It’ll make the perfect tagline.